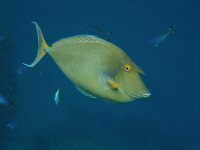 Where better to learn about digital underwater photography than in a Marine Reserve?. This course takes you through all aspects of setting up your digital camera, and using it underwater in a waterproof housing to get the best underwater photos with which to remember your dives. We explain how aperture, shutter speed, depth of field and composition can all help improve your photographs, and cover care of the camera, and adjusting for the best 'white-balance'. 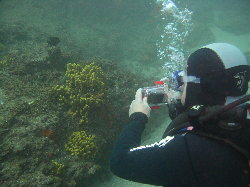 Most of all however we concentrate on having fun using digital cameras underwater. 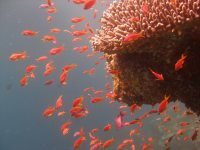 Brian Goldthorpe, who was awarded a 'PADI Certificate of recognition of excellence' for his training, and took all the images on this site, will personally fit the course to your needs, whether you are a beginner or have some photographic experience. This course can also be taken by snorkelers so that they can still benefit from the low cost and availability of modern digital cameras in waterproof housings. Minimum Requirements Divers must have a minimum of PADI Open Water qualification, or any equivalent or higher qualification from another agency. Snorkelers must be over the age of ten. This really is a course that is open to everyone. Course Content and options After reading the manual and completing some introductory theory you do a first dive where we look at wide angle and deep water photography. After a review in the dive centre, it is back out to the sea for a second dive where we concentrate on composition, close shots, white balance etc and in the more sheltered waters practice composition and adjusting exposure. We then review all the results and come up with some tips for improving in the future. Skills covered The course covers digital photographic theory including depth of field, aperture, lighting and composition; and diving techniques including preparation of the camera, safe entry and exit with a camera, testing and using the camera, measurement and adjustment of white balance. The pictures above show how by adjusting the white balance (right) all the colours become brighter and picture quality is improved. Duration and Logistics This can be done as a one dive 'half course'(Level 1) or as a one day, two dive course, however there is quite a lot of theory and practical content, and the best option by far is four dives over two days, instructor guided and reviewed at all times. All transfers included. 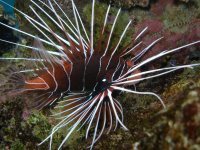 Alternatively if you have several days diving planned it is better to plan for the two dives on separate days, as this provides more time and opportunity for reviewing and improving. What you get PADI Digital Underwater Photography Specialist Qualification, level 1, or level 1 & 2. If you do not want the formal qualification, this course can be run as a photography masterclass. PADI Open Water divers will be able to count one of the dives towards their Advanced Open Water qualification. We download all the pictures taken to a PC and provide a CD of your photos to take away. What Next ? 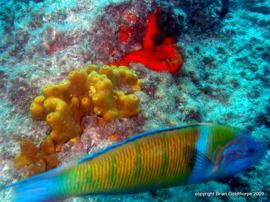 Enjoy yourself on more adventure dives with your digital camera! Take further adventure dives to gain another 'speciality qualification'. 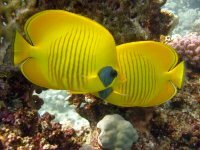 Here are some examples of what can be achieved with good white-balance techniques while scuba diving in the Red Sea! Price The recommended two days of course and photo dives is €230 per person to do both Level 1 and 2, and have plenty of practice with your camera, and includes PADI Registration. If you only want to do one part (eg level 1) the price is €80. For just the one-day option doing Level 1 and 2 without the practice day, the price is €140 per person. Additional days are priced at our normal multi-day rates. The course manual including white balance slate is strongly recommended as this contains many hints and tips and example photos, is €25 per copy. We recommend that you should have a minimum of your own mask, fins and snorkel, and all other equipment can be hired on a daily basis. The price includes all logistics, collection and return and PADI Registration fees. If you want to hire a digital underwater camera this costs an additional €20 per day including micro-SD card of results.